You guys. Holy crap. We saw this recipe Sunday morning (courtesy of the geniuses at BeyondDiet) and we looked at one another and back at the recipe and back at each other and said: WE HAVE TO. For starters, all the ingredients were stuff we keep in our house anyway. For seconds (? ), the points for this glorious dish were only 7 PP a person. For thirds: only a half hour in the oven? Ingredients that can be prepped one at a time? HOKAY YES. And so, we endeavored to make this casserole. Without hesitation, I will tell you it is amongst the best recipes we have ever made. Ever. In our lives. Healthy or not. Now, we got “healthy” versions of the ingredients involved and that influences the points pretty dramatically. So of you’re doing that WW hustle, don’t screw around with reckless ingredient picking. But anyway, here’s the recipe: enjoy! — 4 cups packed fresh spinach (we used closer to 6, and really, there’s no such thing as overdoing it.. spinach cooks down so small! — Preheat the oven to 375. — Grab a skillet. Brown the meat and add whatever seasonings you’re using. When the meat is done, put it in a separate bowl. — Using the same skillet (Chelsea left the meat juices in, too, to avoid using other liquids or oils or butter), saute the mushrooms until they’re tender. We also seasoned these with thyme. When they’re done, put them in their own bowl too. — In the same skillet again, wilt the cups of spinach. Place in a bowl, or leave in the pan. — Drain any water in the spinach and mushroom bowls/pans. — In yet another bowl, mix the egg, the cottage cheese, and the garlic salt (and any other seasonings — we added chives). — Grab a 2 qt casserole dish. Add 1 cup of sauce to the bottom (we did 1.5 cups on the bottom). 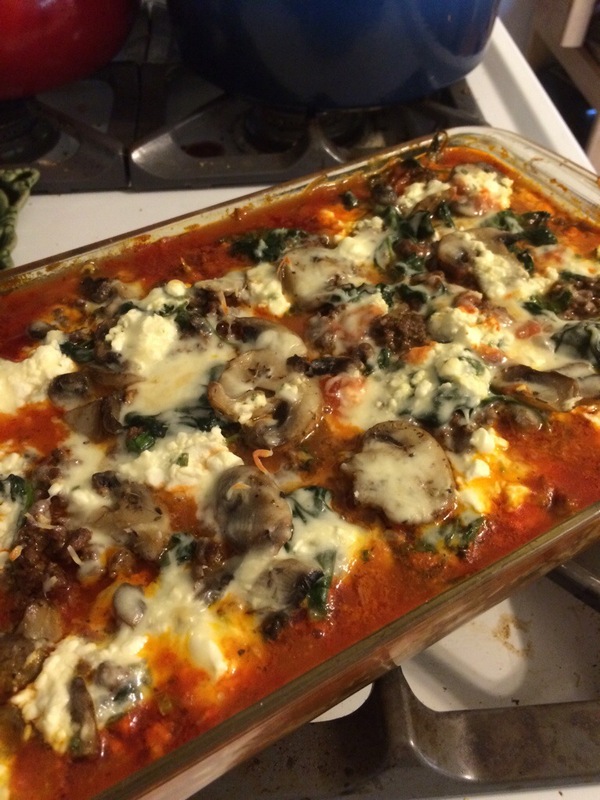 — Add a layer of turkey, then spinach, then mushrooms, then a layer of cottage cheese. Sprinkle with the shredded cheese and repeat the layering process a few times until you’ve got 2 or 3 layers and your ingredients are gone. — Top final layer with whatever’s left of your shredded cheese. — COVER THE CASSEROLE IN TIN FOIL, and bake for 35 minutes. — Take it out after 25, remove the foil, and cook it for 10-15 more minutes until the cheese browns a little and everything is bubbly. YOU WILL NOT REGRET THIS DISH. 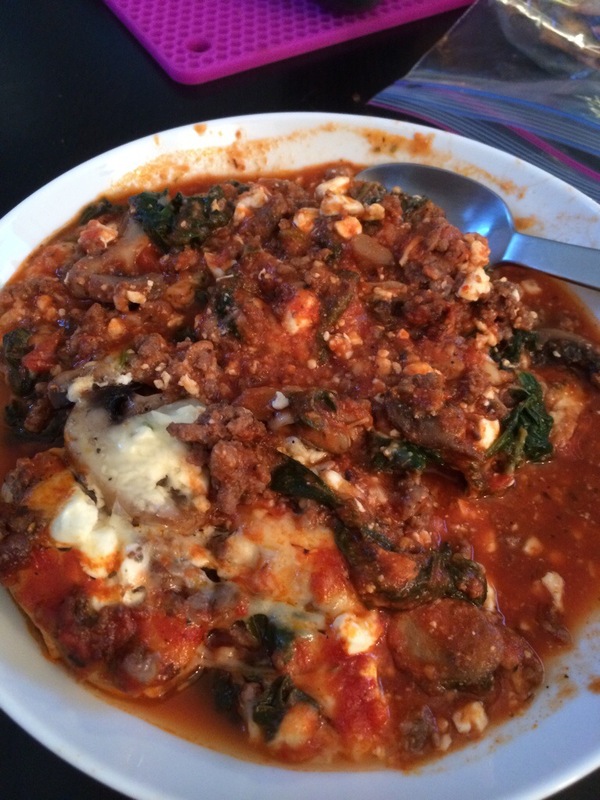 If you’re aiming for 2 cups of lasagna a person, it makes 4 servings. Each serving: 7 PP. This one is definitely worth going out on a limb to try! And further, for those of you on WW or who are conscious of your calories/diet, the “substitute” ingredients we purchased were CLUTCH to making these healthy and low-point. One of the biggest diet traps is making stuff like this and thinking “OH IT’S JUST ZUCCHINI NOM NOM NOM I CAN EAT IT ALL NOM NOM NOM MOSTLY WATER ANYWAY NOM NOM NOM GUILT FREE NOM NOM NOM” because things like flour and bread crumbs are NOT free, not even A LITTLE. And so we’ve included the directions to the original recipe, and some notes about what we followed or tweaked. Now, as a former fried-food-fan (these days, I genuinely don’t think I’d enjoy most actually fried foods if I were to eat them), I really miss things that have that salty, crispy casing on them. As I progress on my WW-journey, I’ve learned to become cool with things that have a semblance of that casing and are BAKED instead of fried. And so when I saw this recipe for zucchini fries, I thought, “Well, heck, it’s the weekend and I’ve got over 40 activity points saved up and all my weekly flex points, so let’s toss this recipe into the recipe builder on my iPad app and see what we’ve got.” Turns out, for 45 fries (our batch made 50), the way WE did it was only 4 PP a person if you split the spoils IN HALF. You heard me: 20-some of these zucchini fries (they are not small) for 4 PP. Obviously, we had to try it. So there I was, looking at the ingredient list for this recipe. It called for flour and bread crumbs. The author of the recipe (original format here) used something called “chickpea flour/besan,” which I had never heard of before. I did some point-sleuthing and, wouldn’t you know it, this miracle powder is LESS POINTS than regular flour! So we needed it. Hmph. Chelsea, I declared, We’re going to the hippie store. I’ve noticed that while not EVERYTHING at Down To Earth is at a reasonable or competitive price (their peanut butters cost nearly twice as much as the same brands do at Wegman’s! ), their bulk foods and baking stuff cannot be beat. Plus, if ANYWHERE was gonna be selling chickpea flour, it was Down To Earth. So off we went. And we found it. And it was $2.00 for a pound of it. Success. Now, bread crumbs… I looked into panko (which we have in the pantry) and wasn’t elated by how many points the recipe would become through its use. A cup of panko is no small amount of points, ya dig? Italian bread crumbs are even worse. So I endeavored to make my OWN bread crumbs, by buying a loaf of WW’s whole wheat bread, double toasting it, and then chopping it in the food processor. Success. The recipe itself is so simple you’ll smack yourself for not having come up with it, and the results are so delicious that you’ll immediately wish you could un-smack yourself since now, you’ll be grateful SOMEONE came up with it. — Preheat the oven to 420. — Spray a bake-able cooling rack with cooking spray and put it on a pan. (Pics in the original recipe’s post will be helpful here). — Make an assembly line: in one bowl, your flour, garlic powder, and any other seasonings. In a second bowl, your milk. In a final bowl, your breadcrumbs. — Dip each little zucchini piece first in the flour, then the milk, then the breadcrumbs. Add to the cooling rack. — Bake for about 20 minutes (in our experience). The above recipe, using flax milk and WW crumbs and chickpea flour, made an 8-PP overall recipe that became 4 PP a person. And we couldn’t even eat them all in one sitting. And so, a point-friendly delicious snack. Discovered this recipe last night on Facebook, and when I realized we had all the ingredients — well, I decided to make it as my evening snack. Now, the original recipe differs from what I used — the ingredients below are what I used in my rendering. I think it nets a little more sweetness and it’s low-points. My secret? Sugar-free maple syrup. Believe it or not, I find the sugar-free brand we use to be freakin delicious — I actually prefer it to regular syrup at this point (excluding, of course, super high-quality maple). Anyway, enough exposition. Here it is! 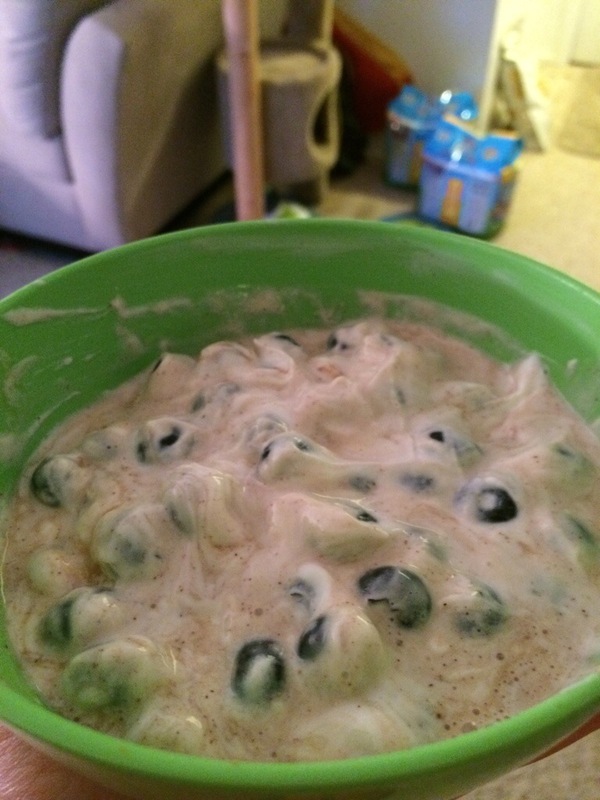 Mix in a bowl, then enjoy! * = Their words, not mine… I just sprinkled some cinnamon on top. Yeah; that’ll be the last time anyone scoffs at sugar-free syrup in THIS blog. Holy crow, you guys: THIS ONE IS GOOD. Made it twice this weekend — once in Scranton for mom and dad, and when mom generously donated the extra corned beef and cheese to our cause, we made it again tonight for ourselves. This casserole hits the same “spot” taste wise as eating a big deli sandwich or pub food — but for a m of the dietary damage! NOTE OF CAUTION: Portion size is key. 1. In a flame-proof casserole dish, heat the canola oil and add onion (slice it thin! ), cook until browning. 2. Add the stained, dried sauerkraut. Cook until browning. 3. Add 1 cup water, corned beef, potatoes, and caraway seeds. Bring to a boil. 4. Once boiling, drizzle 2 TBSP of the Thousand Island Dressing on top, then scatter the shredded Jarlsberg on top. Lastly, sprinkle the bread crumbs and spray lightly with cooking spray. 5. Cook for 25 minutes at 375, or until crumbs are golden brown. We doubled the recipe, giving ourselves each 10PP worth of Reuben casserole for a special Sunday dinner. It did NOT disappoint! She was holding a brick of Daiya nacho cheese, and like she said, the whole thing was ten points. That would be a LOT of cheese — even if we had a “treat night” and split it, it would be only five points! To put this in perspective: one ounce of almonds is 4PP; a Greek yogurt with one tablespoon of flax is 4PP. 5PP IS NOT BAD as far as nacho-cheese-goodness goes, or as anything goes at all. So we brought it home and Chelsea did some internet sleuthing — one woman suggested adding salsa. Okay. Done. Chelsea melted the cheese and stirred the salsa in — I’ll have to ask her for details, since I wasn’t watching. The result: Oh lord, it was so good. It tasted to me (especially with tomato salsa included) like the cheese on top of a pizza that has been mixed with sauce. It was DELICIOUS. We ate it by dipping celery sticks, and it was truly delicious. I think in the future it would totally kick the pants off a craving for actual nachos or for wings or that type of pub food. The best part: unlike its “real” counterpart, this stuff wasn’t oily at all and didn’t leave me feeling gross. A winning situation all around! Now, we have heard that a lot of vegan cheeses are terrible. We have never tried any before this — we’re not vegans, or even vegetarians — but if this nacho flavored one is any indication, the Daiya brand seems pretty okay by me. For real though if you like cheese or savory dips but can’t spare the calories/PP, you’ve GOT to try this stuff. In my eyes, it is for celery what nutritional yeast is for EVERYTHING ELSE. And ya’ll KNOW how I feel about that ‘ish. So already I’ve made it clear that I rediscovered a love of tuna salad. But did you know that you can put COTTAGE CHEESE in tuna instead of mayonnaise?! We had some fat-free cottage cheese in the fridge and decided to give it a try; we used three tablespoons (1PP) per person, in one full can of tuna each. Legit: my new favorite way to make tuna salad. The cottage cheese adds bulk, texture, and a mighty wallop of protein to boot. Everyone wins! I tried this as a first attempt at tofu baking, and it went alarmingly well. – Bake 15 minutes then flip ’em over and bake another 15. Then enjoy! We sure did. This is best served atop a salad or stop something in general since theittle cubes are about crouton size. We had ours over salad. Total recipe makes 14 PP worth of tofu; divided by two it became 7 PP a person. Tofu: How Did I Not Know? Cue all the non-vegetarians bitching about how terrible tofu is. I have seen the light and it is high protein, low carb, and all delicious. Now, I know what you’re wondering: hasn’t she had tofu before? The answer: Of course I have. Any good gay lady worth her wool socks has dated (or is) a vegetarian or vegan at some point. Requirement is usually at least one year of meatless living to advance to full-on Pride Lyfe. And yes, those girls all cooked tofu for me. But they cooked tofu the way College Me cooked anything other than tofu: AKA, they were terrible at it. Their tofu was not much to sniff at. Neither was anything else I made, though, in their defense. So I’ve never REALLY had GOOD tofu. The other night, I was at Wegman’s picking up some things when I decided to make Chelsea and I each a salad bar salad as a treat. I did mostly greens, some veggies, none of the grain salads or anything. Then, I saw some herbed tofu. Something possessed me to want to try some, so I did. Two scoops. Went home, at my salad/tofu, fell in love. Tofu is, apparently, a WW power food. It’s high protein, low carb, and medium fat — aka the perfect blend of punch per point. It comes in various forms, can go in almost anything, can be cooked about a million ways. Of course, my vegetarian friends already know this. To them, I say, ADD THIS TO THE LIST OF KALE, QUINOA AND NUTRITIONAL YEAST. I legit no longer trust the vegetarians and vegans in my life because they keep all these hugely delicious secrets from me. In any event: Sunday night, I made tofu for the first time. Me pressing the tofu was a hot mess/disaster of epic proportions. I mean, it got done, but I looked ridiculous probably. I made oven-baked Italian herb tofu and topped a salad with it. And I made it from scratch. And it was 7 PP for each portion. And now all I wanna do is try new tofu recipes forever. I saw a tofu Parmesan that involved nutritional yeast… And y’all KNOW how I feel about that ish. It’s only a matter of time before I start a daily tofu pressing regimen in my kitchen, perhaps even buying a tofu press. Yes, I am carried away with the delight of it all and yes, I know. And yes, I lack a single care about it. If YOU had the tofu I made Sunday night, you’d be excited too. These taste just as good as the real thing! Pro tip/No tip:To save myself an extra 1PP, I made mine with almond milk instead of fat free milk. The almond milk didn’t fluff up the same way the regular did — it also didn’t taste as good as Chelsea’s, and hers was made with the recipe as it is written below. So in the future, I’ll make mine with milk. We didn’t add food coloring but you totally can if you’re seeking to complete the official shamrock shake feel!